Your customers’ voices are your overlooked revenue. 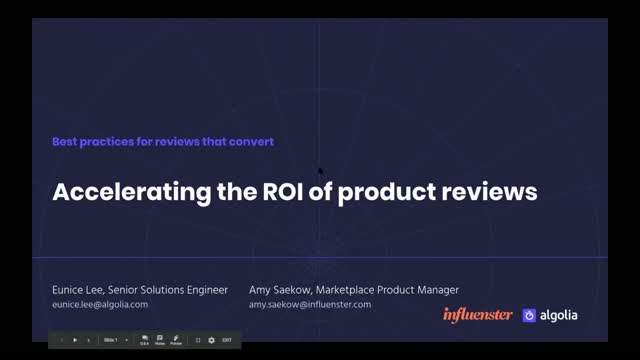 Empower product reviews with search and discovery to drive user engagement and accelerate the path to the shopping cart. Join Eunice Lee, solutions engineer at Algolia and Amy Saekow, Marketplace Product Manager at Influenster on July 26 to learn about best ways to uncover meaningful feedback to jumpstart user engagement and stickiness, and drive growth. Today’s consumers come to your site for experiences, and it is experiences that compel them to buy—and return for more. Join Emily Hayman, Algolia’s Senior Solutions Engineer and search expert, to learn about innovative user experiences that turn browsers into shoppers and move the needle with e-comm KPIs.